Bangalore: Louis Dreyfus Armateurs SAS is set to buy 49% stake in the bulk port handling business of Bombay Stock Exchange-listed port logistics firm ABG Infralogistics Ltd, a person familiar with the deal said on Wednesday, requesting anonymity. Louis Dreyfus, which builds and operates vessels able to load dry bulk cargoes, will pay Rs90 crore for the stake in ABG Infralogistics, the person said. The deal comes as the world battles a crash in commodity demand and prices, triggered mainly by the global financial crunch and slump in global economies. Ahead of the sale, ABG Infralogistics had hived off its bulk cargo handling assets operating at Union government-owned New Mangalore, Paradip and Vizag ports into a separate subsidiary—ABG Bulk Handling Pvt. Ltd. The firm is also the successful bidder for another bulk cargo handling facility at the Haldia dock of Kolkata port, also owned by the Union government. These facilities can handle bulk cargoes such as coal, iron ore, fertilizers, grains and cement. “ABG Bulk Handling has filed an application before India’s Foreign Investment Promotion Board (FIPB) seeking permission to sell a 49% stake in the unit to Louis Drefus Armateurs," said the person mentioned earlier. FIPB vets all foreign investments coming into select sectors in India. A spokesperson for ABG Infralogistics declined to comment. Former subsidiary of family-owned Groupe Louis Dreyfus, which has interests ranging from commodities trading to shipping, oil and gas, telecommunications and real estate, will make further investments in ABG Bulk Handling, depending on whether it wins more bulk cargo handling terminals at ports in India, Asia’s third largest economy, the person said. 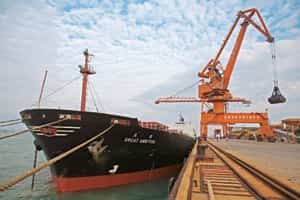 Analysts say that except for iron ore, the overall bulk cargo handling business at India’s ports has not been affected much by the global meltdown because the local economy is largely driven by domestic demand and less dependent on exports. “Out of the main bulk commodities handled at India’s ports, iron ore has been affected by the current global conditions, but others such as coal and fertilizers have not been impacted to the same extent," said Neeta Ramnath, vice-president, infrastructure advisory division at Feedback Ventures Pvt. Ltd. The iron ore cargo at India’s 12 major ports owned by the Union government declined 6.62% during the April-November period this year compared with last year after steel plants in China cut production, according to figures compiled by the Indian Ports Association, an agency of the Union shipping ministry. During the same period, thermal coal used in power plants grew by 5.07% while coking coal used by steel plants jumped 28.91%. The growth was 50.80% in the case of finished fertilizers and 4.3% in raw fertilizers. Feedback’s Ramnath said the current capacity at existing/under implementation ports for bulk cargo was more than sufficient to meet the Indian demand. “However, lack of mechanized cargo handling facilities causes inefficient use of current capacity apart from wastage at ports," Ramnath said. ABG Infralogistics had earlier this year sold an 11.8% stake in the firm to PSA International Pte Ltd, the world’s second biggest container port operator owned by Temasek Holdings Pte Ltd, investment arm of the Singapore government. The Singapore firm also invested about Rs350 crore for buying a 49% stake each in ABG Kandla Container Terminal Pvt. Ltd and ABG Kolkata Container Terminal Pvt. Ltd, the entities floated by ABG Infralogistics to run the two container handling facilities at Kandla and Kolkata ports, respectively. After these stake buys, PSA said it was not interested in the bulk port handling business of ABG Infralogistics. Hence, this business was spun off into a separate unit to give it a focused attention and to attract a potential buyer.